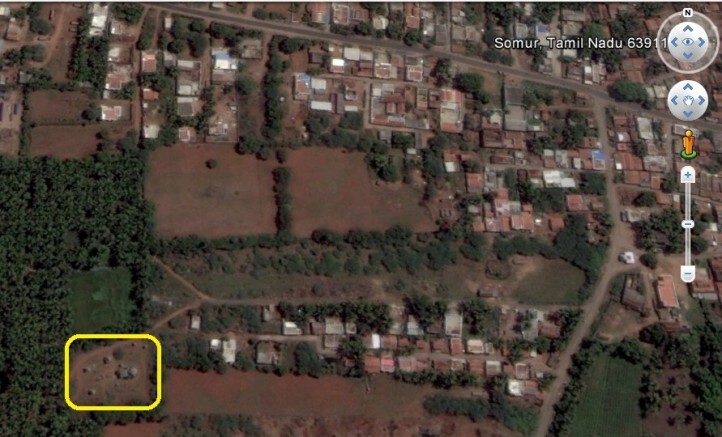 Somur is a remote village located in the district Karur lying 10 kms east of the district headquarters Karur. One can reach the village through Puliyur while travelling from Thiruchirappalli or through Vaangapalayam from Karur. The significance of this remote village is due to the existence of an Early Chola temple called Someswara shrine. The temple is located on the south western side of the village lying secluded from the habited area. The inscriptions mention the Village as Thirunombalur and the deity as Thirunombalur Mahadevar. The earliest inscription of the temple belongs to the 6th regnal year of Parantaka Chola I, found on the northern wall of the sanctum confirms its existence during CE 10th century. Besides, the architecture also substantiates its origin as Early Chola period. Inscriptions of the Cholas viz., Rajaraja I and Rajendra I are also found. 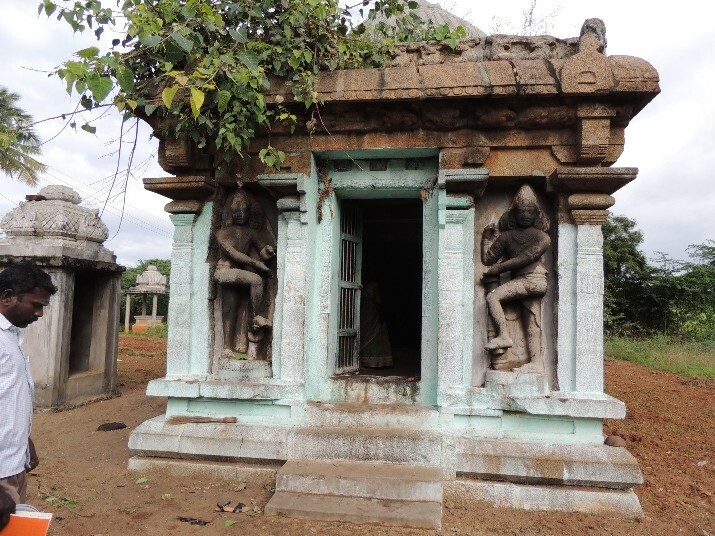 An interesting fact is that the temple still remains the same what had been left by the great king Parantaka I without any later additions in course of time. 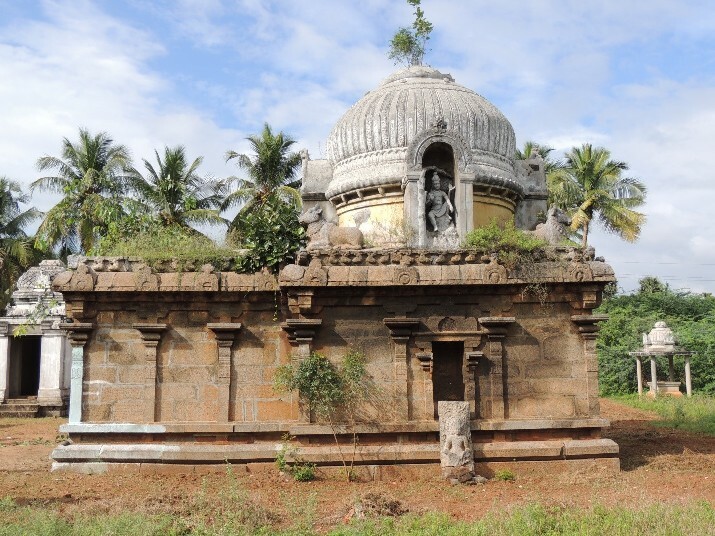 It gives a great sense of satisfaction of viewing a virgin temple of Parantaka I.
Jagati, octagonal kumuda, kantha flanked by kampas with intersecting padas and pattika are seen in the adhishthana, the upana is inhumed in soil. Above the pattika is the upari kampa on which slightly inside raises the wall. The walls of the vimana are sectioned by four brahmakantha pilasters each one at the corners and two in the middle which forms the Vimana into three segmentations. The pilasters possess upper ornamentation of Malasthana,Padmakattu,kalasa, tadi, kumbha, pali, phalaka and Virakantha. The mala and sthana are ornamented with scrolls, in some of the pilasters the mala has downward flowing scrolls and some carry festoons. The kalasa and kumbha also possess embellishment. The potikas that rests above the pilasters are angular taranga with the median patta. The tarangas are shown as slender waves both in the base and angular sections each carrying three. The kulavu (inverted curve) the specific feature of the early architecture is shown in the angular section. The tarangas are not running to the entire arms of the potikas instead it becomes flat while reaching the uttira. (such potika is seen in Thirupundurutti) The arms of the potikas bear the uttira and above it is the vajana and valabhi. The valabhi is adorned with bhuta series. 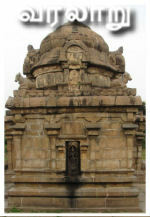 The roof of the vimana extends in all its sides as flexed overhanging kapota. The kapota is ornamented with kudus arranged just corresponding to the pilasters and chandramandalas are shown in the ridges. Provisions for ornamentation at the corners of the kapota are seen but remain incomplete. The bhumidesa shown above the roof denotes the end of the tala. Kudus and arches are sculpted on the Kapothas in all directions has Gandarva heads. The Niches are flanked by split pilasters of brahmakantha type with the same features as shown in the pilasters of the vimana wall. Above the lintal there is a valabi. Makara thorana is seen above all the Niches. The Vesara shikara on its outer side is finished with modern plastering whereas on its inner side reveals the existence of the original structure, the dome made of brick. The griva is long with uttira, vajana and above it the maddalas arranged consecutively. Mahanasikas are shown in the cardinal directions adorned with Siva, Brahma, Dakshnamoorthy& Muruga. Nandi is shown seated at the four corners on the roof. The mandapa comparatively smaller in size both in length and breadth carry the same features of the tala of the vimana viz., adhishthana, bhitti sectioned by pilasters and prastara with all usual components. The walls of the mandapa possess four pilasters each arranged in equal distribution of space. The doorway to the mandapa is on the west in which the middle two pilasters flank the entrance and are shown as split pilasters. On either side in between the pilasters niches are formed and dvarapalas are placed in it. The entrance possess door frames, the jambs and the lintel are embellished with heavy scrolls denoting the ‘thorana vayil’. Above the lintel is shown the kantha pada like sectioning. A flight of four steps leads to the mukha mandapa. Inside in the mandapa, the presence of potikas with a cavity in the base denotes the existence of pillars but at present not found. The two potikas shown inside also carry the same features of angular-taranga-kulavu. 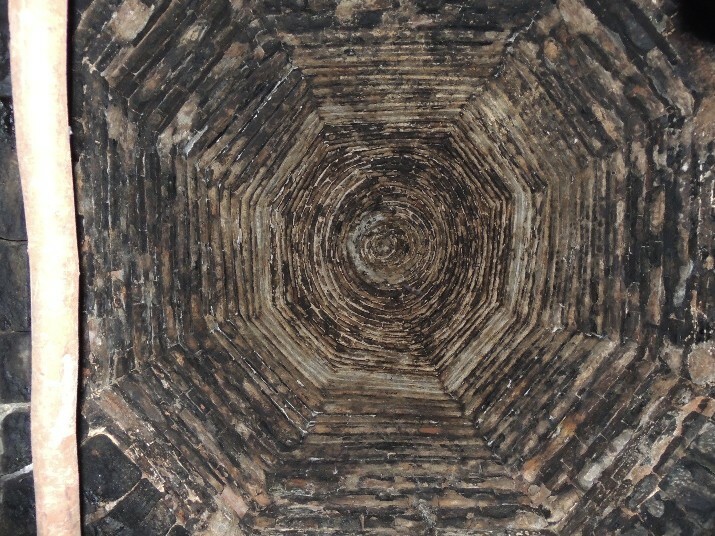 The roof of the mandapa is shown as three sections, partitioned by prastara carrying uttira, vajana, valabhi features. Roof of the mandapa is covered with stone slabs. Ganesa and a Goddess are seen inside the mandapa. The mukha mandapa leads to the sanctum. The sanctum entrance also possesses the same ornamental door frames but concealed by modern construction. The sanctum houses the God Someswara in the form of Linga. The vesara avudaiyar has padma ornamentations. Around the temple new constructions are seen and some sculptures are also found scattered around the temple.